Sound, as I'm sure you're aware, is basically just vibrations in the air. Microphones work by translating those vibrations into electronic signals, and then passing those signals on to something else - usually a computer of some sort. Different microphones perform that task in different ways, but the electret microphones used in most smartphones and tablets do it by measuring the change in distance between two plates inside a tiny capsule. When a sound wave comes along, the pressure inside the capsule changes and the plates move. It works pretty well. But a team of researchers at Binghamton University believe there might be a better way. Ron Miles and graduate student Jian Zhou think that we could learn from the way insects listen to build more sensitive microphones. "We use our eardrums that pick up the direction of sound based on pressure, but most insects actually hear with their hairs," Miles explains. Those hairs, which are spread across the body, move with the sound waves travelling through the air. 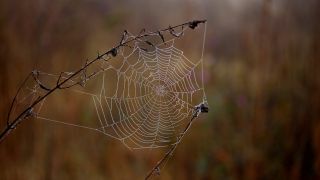 In a study recently published in the journal PNAS, Miles and Zhou lay out a system that uses spider silk to do something similar. “We coated spider silk with gold and put it in a magnetic field to obtain an electronic signal,” said Miles. The benefit of this extra fidelity is that it makes it easier to filter out background noise - great for mobile phone microphones, but also great for hearing aid users and more. “It’s actually a fairly simple way to make an extremely effective microphone that has better directional capabilities across a wide range of frequencies," said Miles.